Home decor has seen a lot of trends over the years. For decades on end, people were covering their toilet seats with shag carpeting for some reason. Then there was that point in the eighties were animal print came into play in a real way. And can we try and forget that era when round beds were popular (how is that comfortable?). But these days, there's a new trend in town. It's Necropolis chic! Plain Egyptian style had its day. Now it's time that the decor of mysterious tombs and crypts come into play in our homes. Accent side tables with mysterious urns. Replace floor lighting with mysterious sconces. 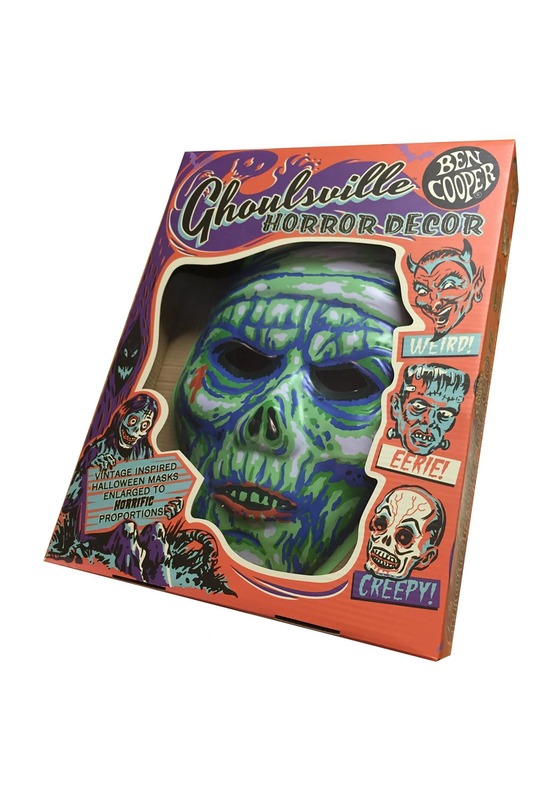 And most of all, hang this mummy mask on the wall for a look that'll say you've got a tomb with a view! This over-sized mummy face has been cast for three-dimensional decor that even stands out in the dark. The mask is almost two-feet across and has details painted throughout the face. Make it a set when you pair it with the rest of the Vacuform monster masks. The mummy's curse isn't the only scary thing about an ancient Egyptian theme. This mummy's skin tone is also very disturbing. Take a good look and you'll never skimp on your bedtime routine ever again!